The MI25 delivers leadership in FP16 and FP32 performance in a passively-cooled single GPU server card with 24.6 TFLOPS of FP16 and 12.3 TFLOPS of FP32 peak performance through its 64 compute units with 4,096 stream processors. The Radeon Instinct MI25’s powerful compute engine and advanced memory architecture, combined with AMD’s ROCm open software platform and ecosystem, provides a powerful, flexible heterogeneous compute solution that allows datacenter designers to meet the challenges of a new era of compute and Machine Intelligence. 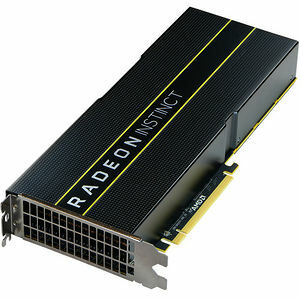 The Radeon Instinct MI25 accelerator brings in a new era of compute for the datacenter with itsNext-Gen “Vega” architecture delivering superior compute performance via its powerful parallel compute engine and Next-Gen programmable geometry pipeline improving processing efficiencies, while delivering 2x peak throughput-per-clock over previous Radeon architectures. The Radeon Instinct MI25 provides increased performance density, while decreasing energy consumption per operation making it the perfect solution for today’s demanding workloads in the datacenter. Design support for AMD’s MxGPU SR-IOV hardware virtualization technology, the Radeon Instinct MI25 provides a VDI solution with dedicated user GPU resources, data security and version control. Plus, a cost effective licensing model with no additional hardware licensing fees, and a simplified native driver model ensuring operating system and application compatibility. The Radeon Instinct MI25 accelerator has advanced out-of-band manageability circuitry for simplified GPU monitoring in large scale systems. The MI25’s manageability capabilities provide accessibility via I2C, regardless of what state the GPU is in, providing advanced monitoring of a range of static and dynamic GPU information using PMCI compliant data structures including board part detail, serial numbers, GPU temperature, power and other information. AMD’s ROCm platform provides a scalable, fully open source software platform optimized for large-scale heterogeneous system deployments with an open source headless Linux driver, HCC compiler, rich runtime based on HSA, tools and libraries.